Are you ready for the scariest night of the year? No, I don’t mean parent-teacher conferences, I mean Halloween! 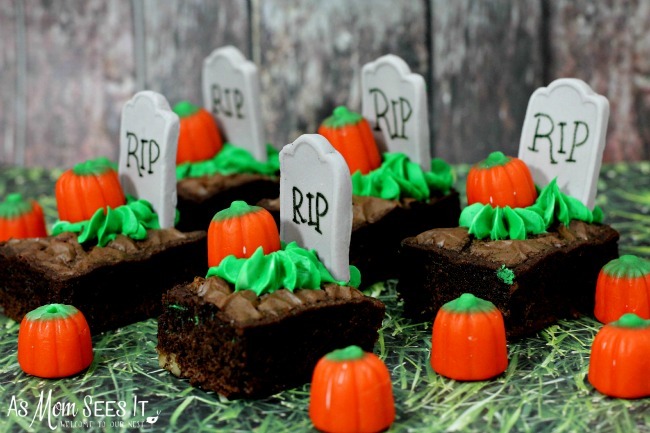 These Halloween Graveyard Brownie Bites are sure to excite your party guests. They’re easy to make and they’re chocolate – need I say more? Preheat oven to 350°F. Use baking spray to coat the baking dish lightly. Mixing in each ingredient as it is added to the bowl, pour 2 cups of sugar, 1 cup of melted unsalted butter, 1/2 cups of cocoa powder, 1 tsp vanilla, 4 room temperature eggs, 1+1/2 cups of flour, 1/2 teaspoon of baking powder, and 1/2 tsp salt to a bowl. Bake at 350°F for 20-30 minutes or until an inserted toothpick comes out clean. Allow to cool before cutting into bars. Combine 2 egg whites, 1 cup of powdered sugar, 1/2 teaspoon of Cream of Tartar in a mixing bowl. Beat on medium speed for 4 minutes. If icing isn’t stiff enough, add 1/4 cup of powdered sugar. Add several drops of green gel food coloring into the bowl and mix well to distribute color. Use Tombstone candies (found at Michael’s) and a Wilton Foodwriter (also at Michael’s) to create the tombstones. Use the green icing and a Wilton tip #223 to create the frosting grass. 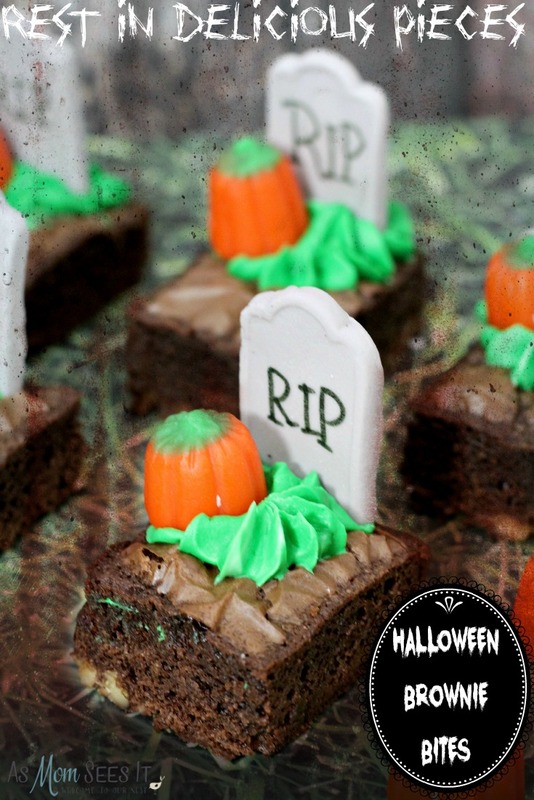 Place your tombstone at the back of the brownie and add a candy pumpkin on the icing grass.